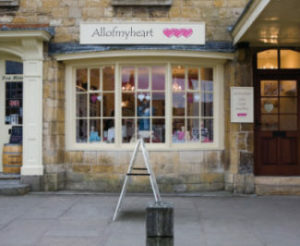 Broadway is the perfect Cotswold village, with delightful mix of historic buildings, thatched roofs, gorgeous walks, hidden courtyards great pubs and some fabulous independent shops and galleries. There is excellent road access and convenient parking at either end of the village. All Of My Heart was established in 2003 and moved to Broadway in the summer 2006. 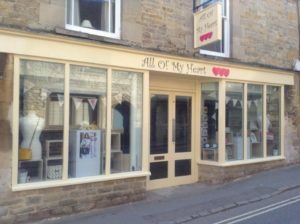 We are housed in a grand old Cotswold stone double fronted building which was once the village stables then petrol station when the main A44 London to Worcester road rolled on through. The through traffic has now diverted leaving Broadway high street, lined with chestnut trees, with a softer, gentle feel along its entire length. We can be found at the western end of the village where the street widens out to encompass a gorgeous green. Call in at All of My Heart on your trip to Broadway and you will be sure to find great love and friendship gifts for all occasions. Inspire the heart in a beat, cause a flutter, heartfelt thoughts and gifts a symbol of all that’s meaningful, let loose emotions of love, friendship, caring inspiration, surprise, passion or thoughtfulness, beautiful heart shaped and themed gifts perfect for weddings, birthdays, engagements, anniversaries, treat others or indulge yourself.